Almost exactly one year ago, we opened Viget's first remote office in Durham, North Carolina. At the time, we didn't really know what to expect. We knew we had two great people heading down from HQ to blaze the trail, and a familiar face already there, but there were lots of questions. Could we grow the team in Durham? Could we connect with the local web community? Could we find a cool space to work in? A year later it's clear: yes, yes, yes. Emily tracked down a very cool little space next to Brightleaf Square, we've had some amazing people join the team, and we did our part to support the community through successful Refresh events -- which has led to lots of friends in town. In fact, we're now to the point that we've outgrown our little space, and are in the process of expanding. 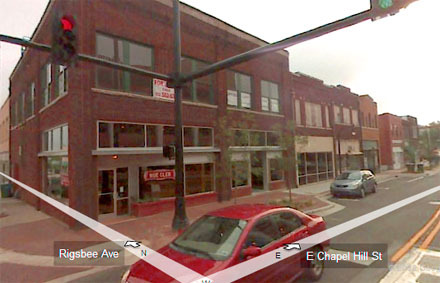 Our new address (not yet, we'll let you know when) will be 202 Rigsbee Ave, on the corner of Rigsbee and E. Chapel Hill St. We'll be taking the 2nd floor, directly above Rue Cler, a sweet little restaurant and bakery. While it's not far from our current office, we're exciting to be directly taking part in the resurgence of downtown Durham, which has really picked up in the year we've been in town. Unlike our brand-new building at HQ, 202 Rigsbee is an urban classic: all brick, slightly-sagging floor, huge old windows, and lots of character. We'll do our best to post updates over the next month or two as the build-out continues, and we look forward to inviting everyone over to check it out once it's done.